Sprint training is an exercise regimen that burns fat, builds muscle, and boosts BMR (Basal Metabolic Rate). Because studies have shown that short bursts of running are more efficient than long walks or jogs, sprint training is becoming the recommended method of choice for cardiovascular exercise. You will only want to perform sprint training exercises a couple times a week. All sprint training is high intensity and high impact. You should allow yourself at least 48-hours of rest between workouts to prevent injury. Always be aware of your surrounding area. Make sure it provides ample space and is safe for running. Consider traffic, debris, foliage, and lighting. Make sure you perform sprint training in a safe location. When you have decided on a location, warm up by speed walking or jogging for about three minutes on your chosen route. If you are an incline sprinter, you can jog in place for three minutes before doing some dynamic stretches. Then, start sprinting uphill. Your sprint time will be determined by how long you have been sprint training. 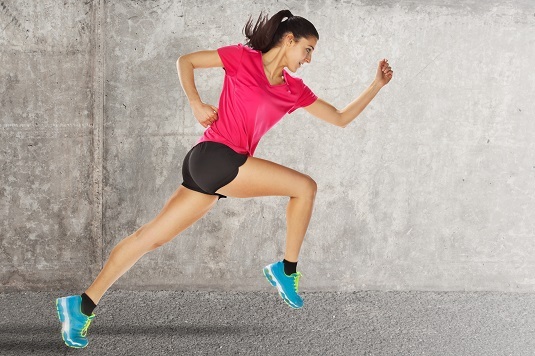 Beginners usually sprint in 30-second increments. Seasoned sprinters usually sprint for 180 seconds (two and a half minutes per sprint). Each burst of sprinting is followed by a rest period. The rest period is not for standing around or sitting, but rather for walking back to your starting spot (so you can get ready to sprint again). The constant movement helps you avoid muscle cramps while your body continues to burn calories. Repeat the run, rest, run actions, increasing your intensity (speed) each time. Begin the first sprint at 50 percent intensity, ending your last sprint at 100 percent intensity. Give the final sprint everything you’ve got. Always remember to stay hydrated and consider sprinting indoors during extreme weather.